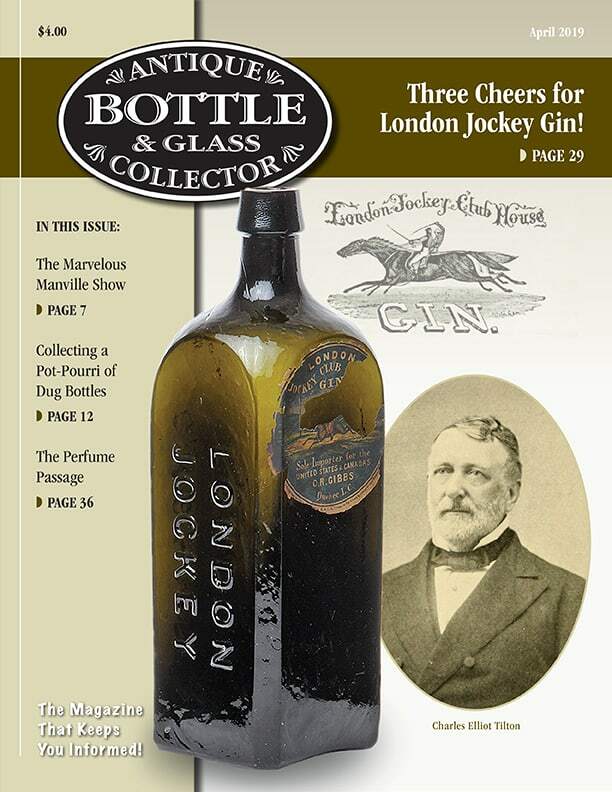 David Hostetter was a millionaire manufacturer of one of the most, if not the most famous and successful bitters ever produced, the Dr. J. Hostetter’s Celebrated Stomach Bitters. Much has been written about the brand. I thought I would try to tie it all together. 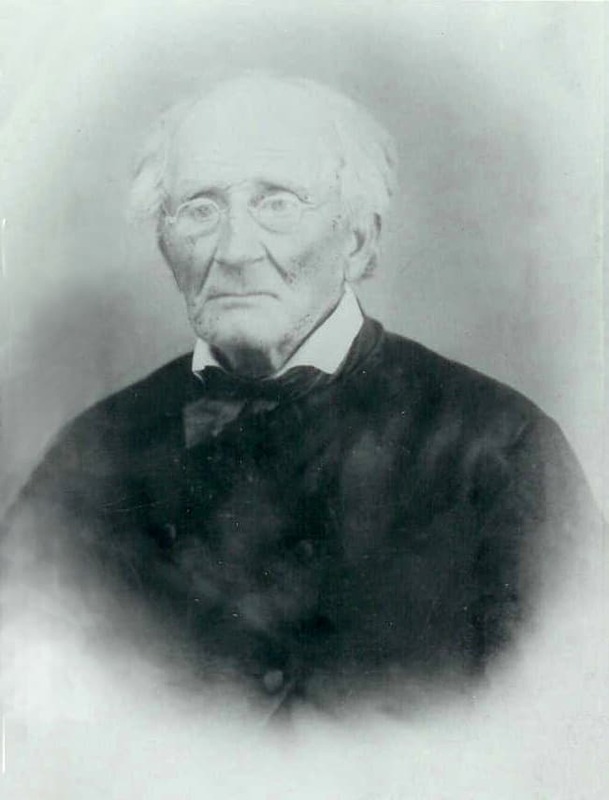 Of Dutch extraction, David Hostetter was the eldest child of Jacob Hostetter by his wife Mary Landis, and was born in Lancaster County, Pennsylvania on 23 January 1819. 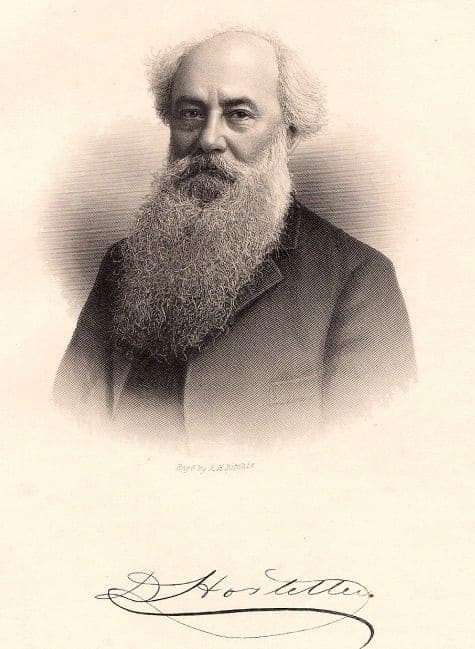 Dr. Jacob Hostetter was born on 13 October 1785 in York County, Pennsylvania and actually developed the original formula for the bitters. 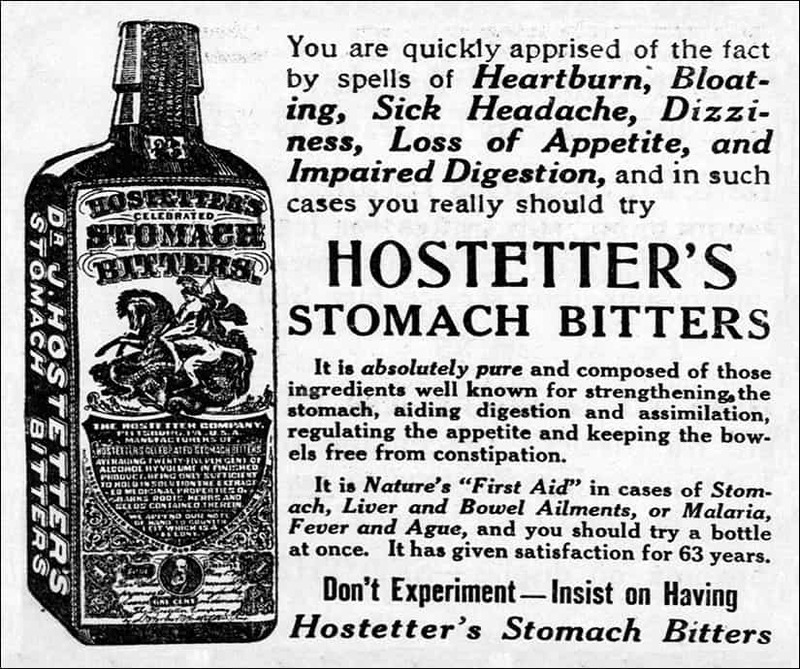 Dr. J. Hostetter prescribed the medicinal tonic to his clientele and it evidently did not occur to him to place the product at the disposal of others outside of his own practice. David Hostteter was educated in Lancaster County and at the young age of 15, was employed as a clerk and salesman in a dry goods establishment in his native town. He worked in this capacity up until 1842 when he began a business of his own that met with moderate success. 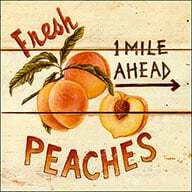 In 1850, David Hostetter moved to California to capitalize on the Gold Rush and settled in San Francisco with a grocery business. The California Gold Rush (1848–1855) began on January 24, 1848, when gold was found by James W. Marshall at Sutter’s Mill in Coloma, California. The news of gold brought approximately 300,000 people to California from the rest of the United States and abroad. In the following September, Hostetters entire stock was destroyed by fire. The San Francisco Fire of 1851 (May 3–4, 1851) was a catastrophic conflagration that destroyed as much as three-quarters of San Francisco, California. During the height of the California Gold Rush, San Francisco endured a sequence of seven bad fires, of which this was the sixth and by far the most damaging. In terms of property value, it did three times as much damage as the next most destructive of the seven fires. With this disaster, Hostetter returned home to Pennsylvania where he worked as a paymaster for McEvoy & Clark and a contractor for the railroad at Horseshoe Bend. 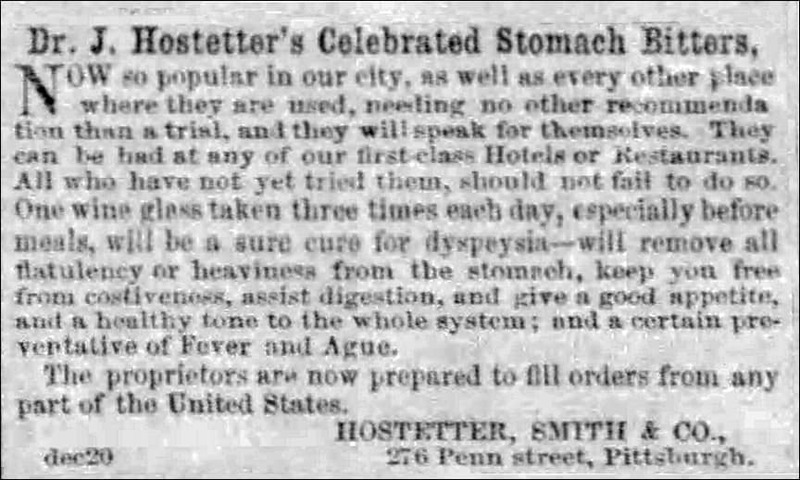 In 1853, Hostetter associated himself with George W. Smith, a boyhood friend, and organized the firm of Hostetter & Smith selling Hostetter’s Celebrated Stomach Bitters. George. 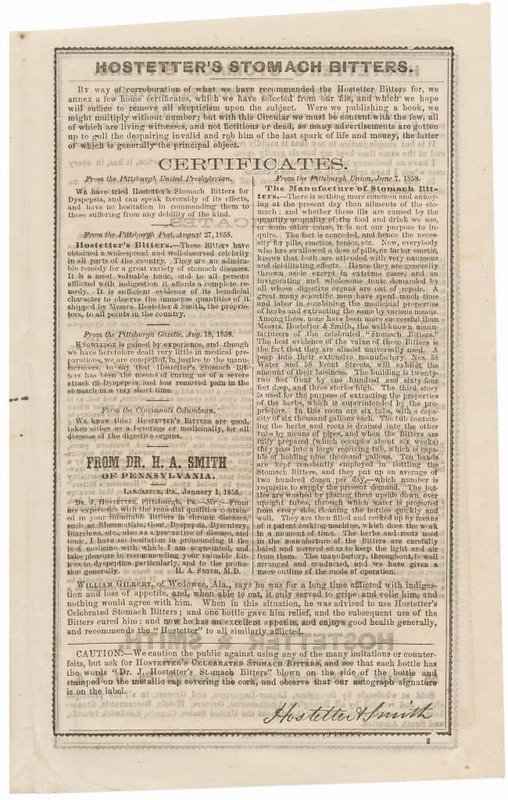 W. Smith, Esq., was a junior partner and was also a native of Lancaster County, Pennsylvania. He was born in the city of that name on 22 February 1823. David Hostetter married Rosetta Cobb Rickey in Cincinnati, Ohio on 13 July 1854. She was born on 06 October 1829 and died on 03 July 1904 and was a daughter of Randall Hutchinson Rickey by his wife Susanna McAuley. 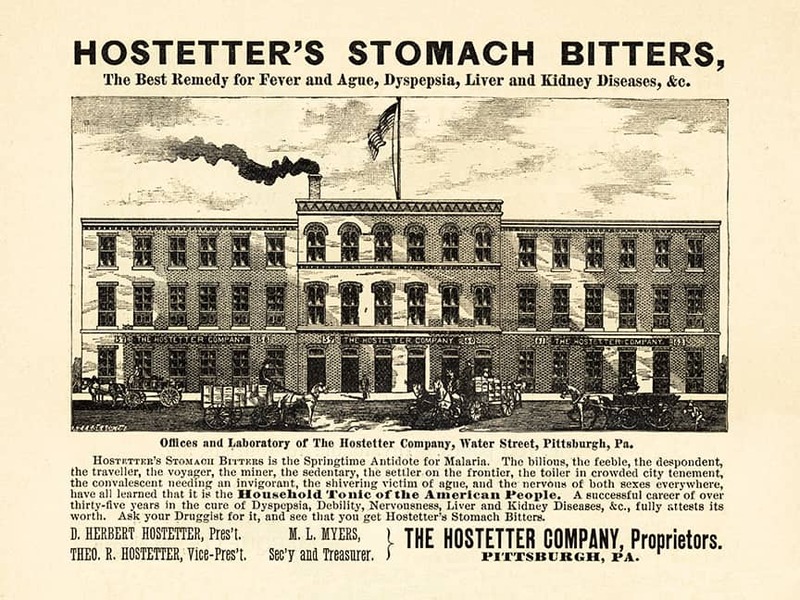 At that early period in its history, the firm of Hostetter & Smith occupied part of a building on Penn Street in Pittsburgh, at a rental of $175 per annum. 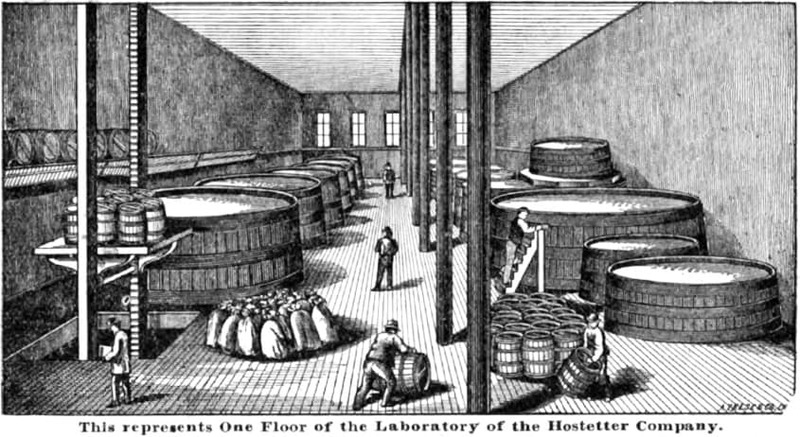 The total staff of employees engaged in the manufacture of the bitters would scarcely number half a dozen. 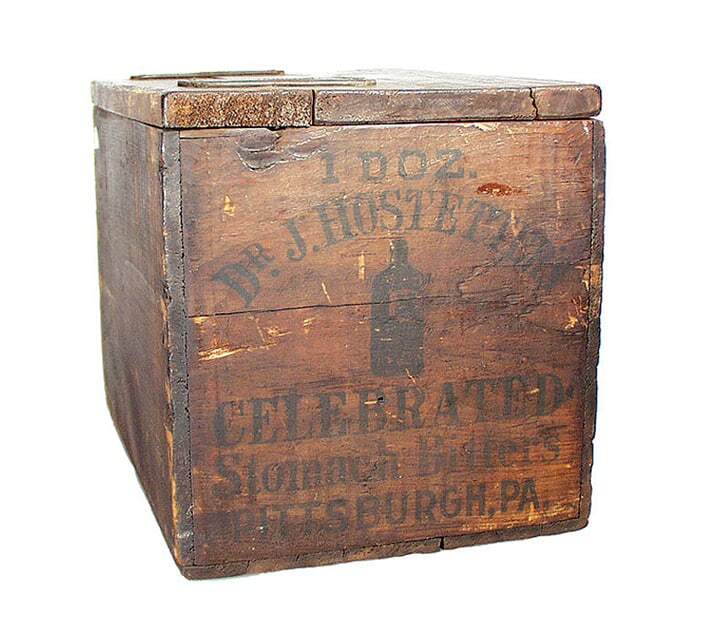 The medicinal compound was manufactured in Pittsburgh in accordance with the formula discovered by his father, Dr. Jacob Hostetter, who in 1853 retired from medical practice and gave his consent to his son David, who had for some time realized the value of the medicine, to manufacture and sell the formula to the American people. 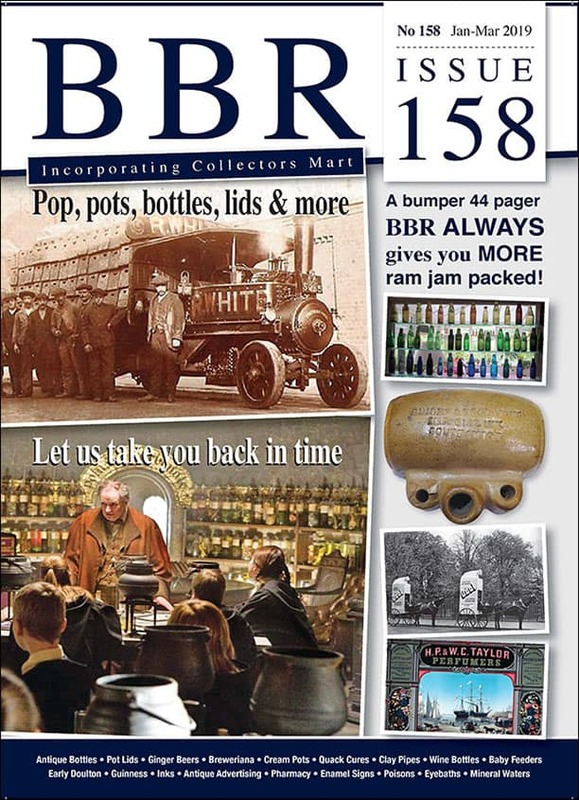 The first few years of business were rather discouraging, but the partners were young men with limitless ambition, and after a great deal of missionary work, and with what was then considered quite an expenditure for advertising, the business began to grow during the late 1850s. 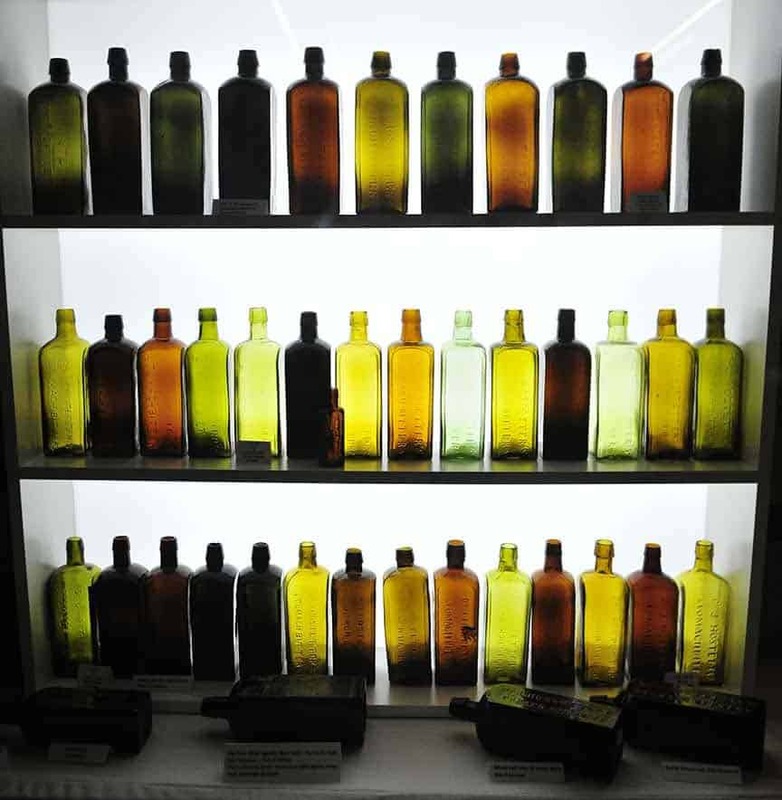 Naturally, the reputation that the medicine obtained in Pennsylvania reached neighboring states and was finally known, not only in United States but also in South American countries. 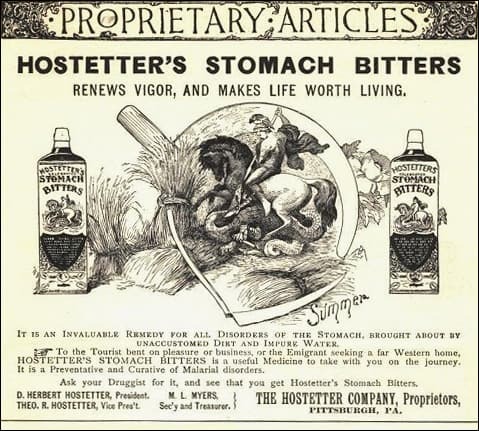 The trade mark of St. George and the Dragon, early on became synonymous with Hostetter’s Stomach Bitters (see above). Saint George (c. 275/281 – 23 April 303) was, according to tradition, a Roman soldier from Syria Palaestina and a soldier in the Guard of Diocletian, who is venerated as a Christian martyr. In hagiography, Saint George is one of the most venerated saints in the Catholic (Western and Eastern Rites), Anglican, Eastern Orthodox, and the Oriental Orthodox churches. He is immortalized in the tale of Saint George and the Dragon and is one of the Fourteen Holy Helpers. His memorial is celebrated on 23 April, and he is regarded as one of the most prominent military saints. 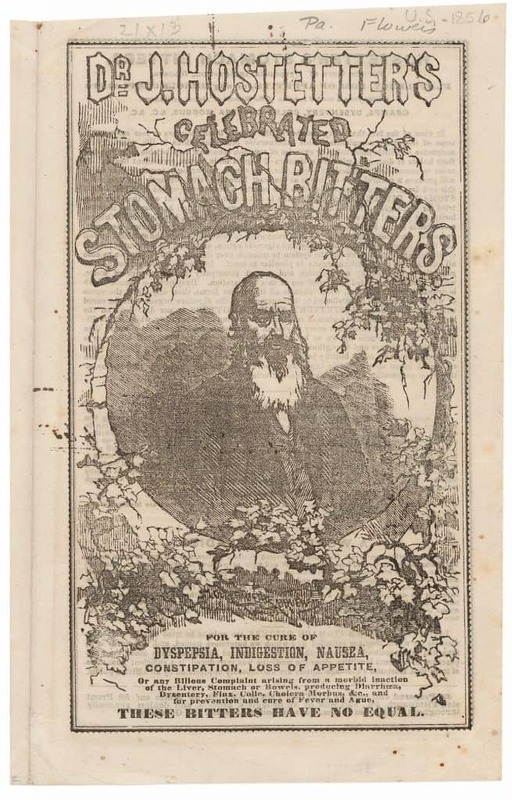 Later in the 1850s, Hostetter’s Stomach Bitters would became a national best-seller. 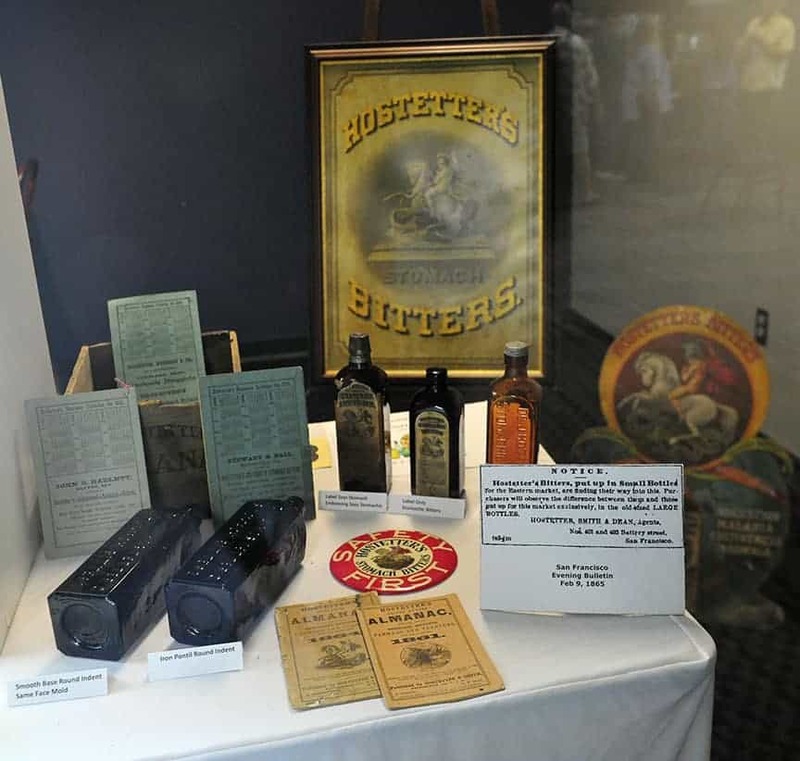 With the increase of business, Hostetter & Smith moved to Nos. 57, 58, 59, 60 and 61 Water Street in Pittsburgh. The additional space was added until the concern occupied five, three-story buildings fronting 110 feet on Water Street, with a depth of 160 feet to First Avenue. 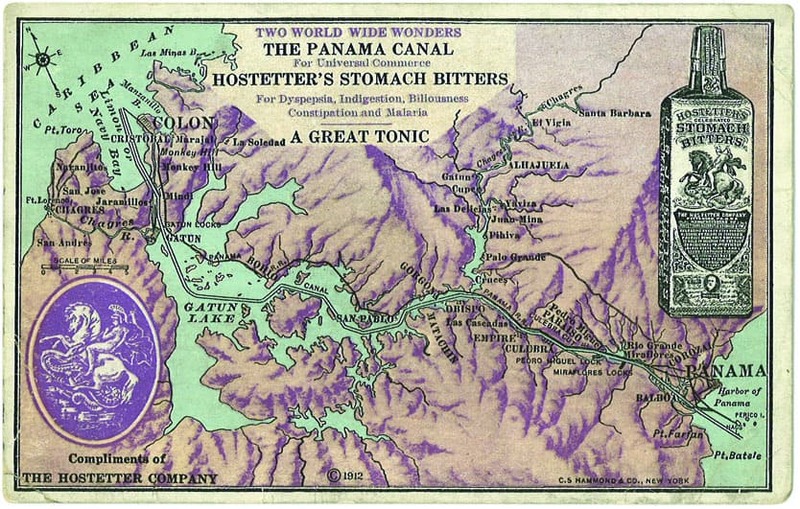 They covered an area of over half an acre and were admirably situated for purposes of shipment by rail or river, through which mediums large quantities of Hostetter’s Stomach Bitters were shipped to all parts of the United States and territories, to South America, Australia and other foreign countries. 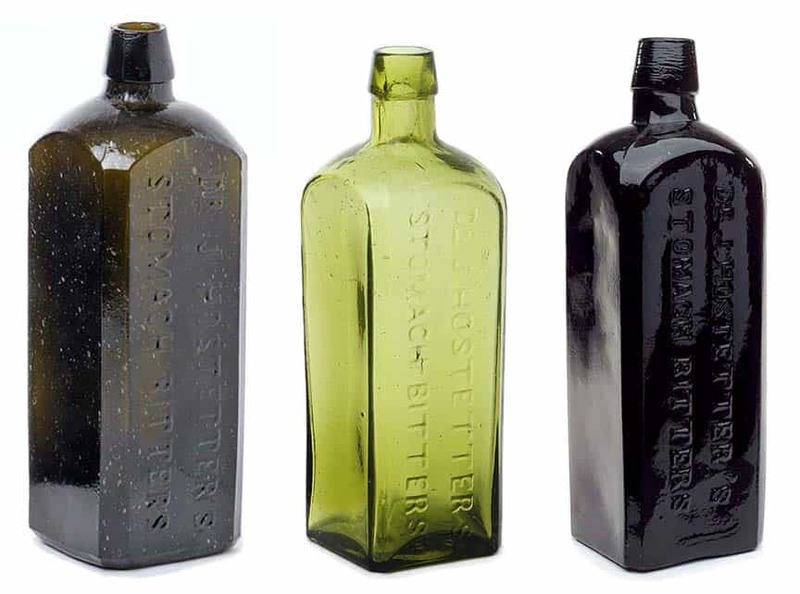 The earliest Hostetter’s bottles could be from John Agnew and Son, Pittsburgh, 1854-1866, or Adams and Co., Pittsburgh Pa., 1854-1891. One of the largest early mass producers of bottles for Hostetter’s was Lorenz and Wrightman (L&W), Pittsburgh, Pa, 1862-1871. 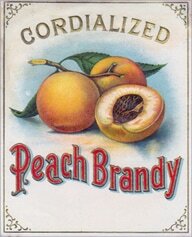 Another notable large producer was W. McCully & Co. 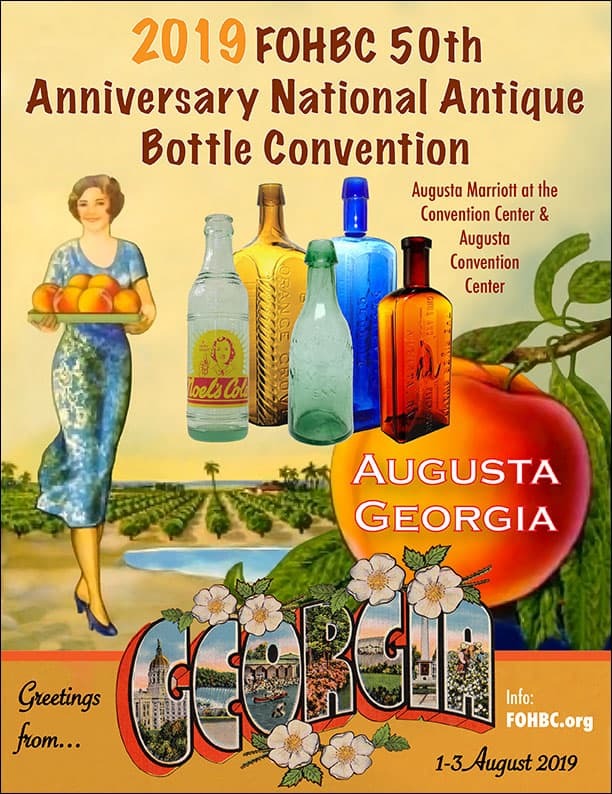 There were also other glass houses that made the bottles such was the need for bottles. 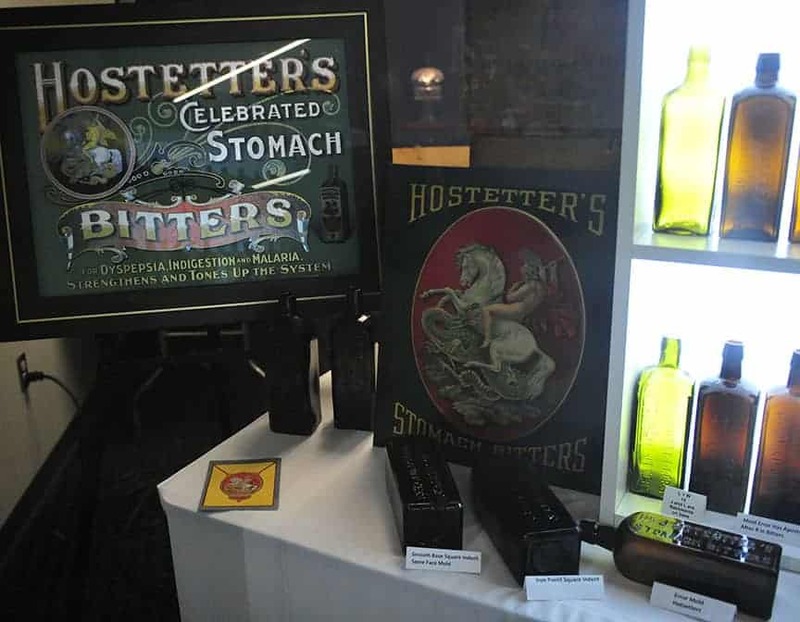 Counterfeiting the Hostetters brand was also rampant so much effort was made to guarantee the product and seek damages from the perpetrators. 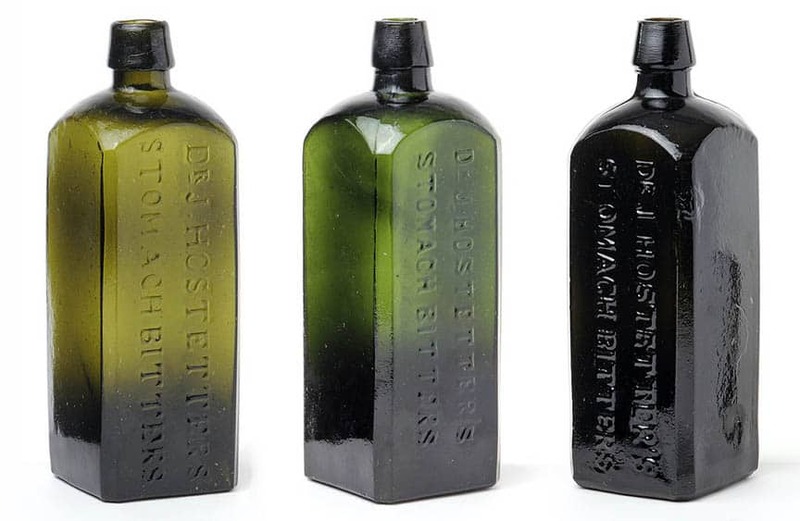 There were so many empty bottles being discarded that some shady dealers simply filled the bottles with some form of glop and sold it for less than Hostetter’s Stomach Bitters. This prompted the authentic signature on the Hostetter’s label. Nine accountants, correspondents, etc, were engaged in the counting rooms of the firm, and it is was not an over-estimate to say that in its direct and contingent operations, such as the gathering and growing of the necessary medicinal drugs, the manufacture of the paper with its dependent industries, the product of grain and its conversion to spirit, etc., the firm eventually employed directly and indirectly the labor of 1,000 people daily, and so far, aside from the intrinsic merits of its specialty, becomes a great factor in promoting the general good in Pittsburgh. 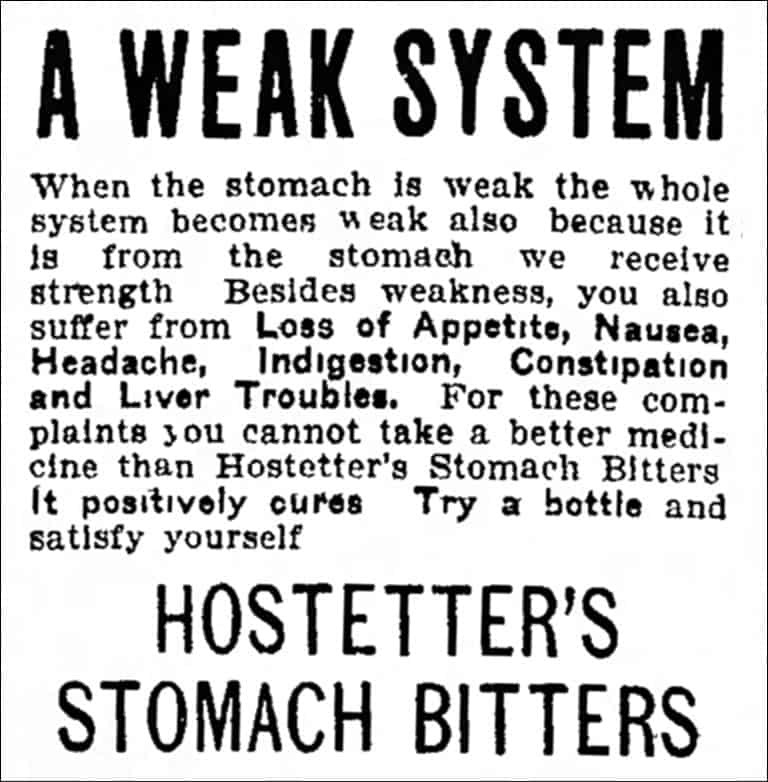 When first established, the manufacture of Hostetter’s Stomach Bitters was entirely a manual operation. 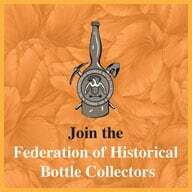 The enormous increase in production, however, made this process impracticable, and machinery and apparatus of the best construction, with a capacity for putting up 500 dozen bottles per day was employed in preparing and bottling the bitters. In this department of the work, there were fourteen very large tanks, 15 feet in diameter and 5 feet high, and ten tanks 8 feet high and 6 feet in diameter. The department employed, in manufacturing, packing and shipping, not less than 50 hands. About this time, it was necessary for Hostetter & Smith to establish a branch office in New York City, and agencies in New Orleans, San Francisco and St. Louis. From the early 1860s, the business developed from several hundred thousand dollars until in 1872, it had reached the million dollar mark. One big reason for this success was the Civil War. 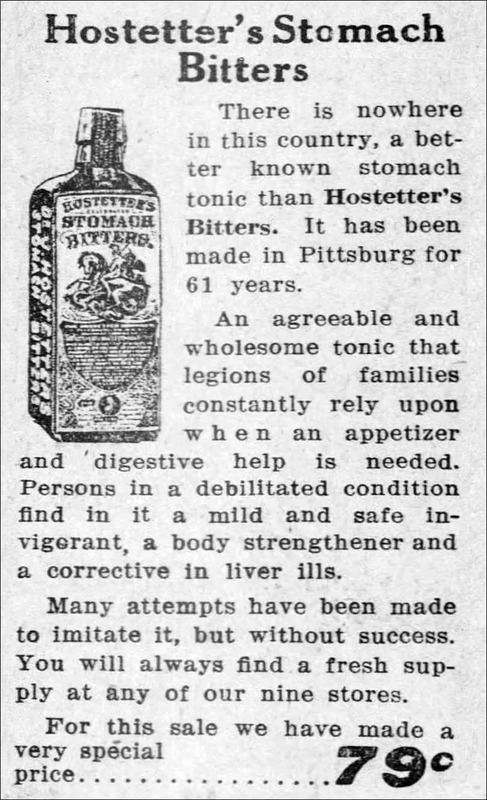 During the Civil War, Dr. J. Hostetter’s Stomach Bitters was sold to soldiers as “a positive protective against the fatal maladies of the Southern swamps, and the poisonous tendency of the impure rivers and bayous.” The original formula was about 47% alcohol and was 94 Proof! 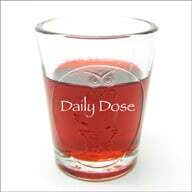 The amount of alcohol was so high that it was served in saloons by the glass. David Hostetter, from the beginning of business, formulated a wise policy of making personal visitations on wholesale drug and commission houses. 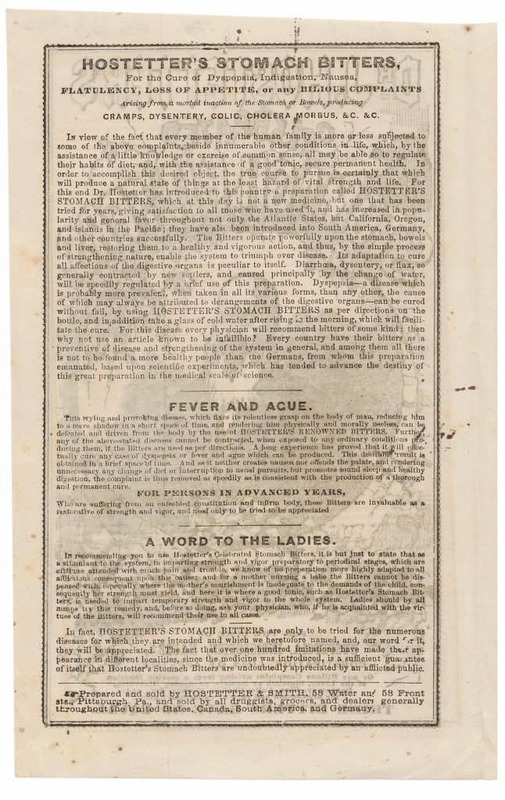 This was augmented by consistent advertising in almanacs, newspapers, magazines and exhibits. Hostetter published almanacs continuously from 1861 to 1910, when it was discontinued and no edition was published until 1933. The business, however, contained the elements of success, and under the consummate tact and resolution of its projectors annually increased, with rapidly augmentive revenues and proportionately enlarged facilities in every department. 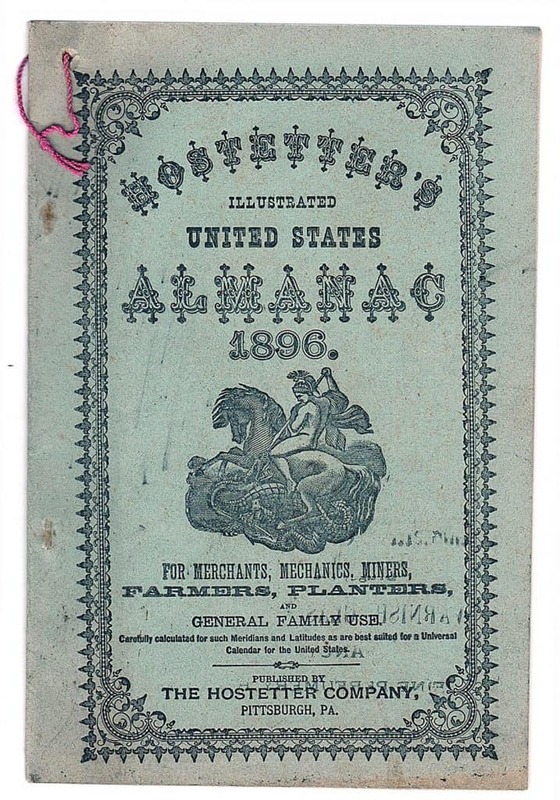 The extent to which the operations of Hostetter & Smith reached may be illustrated by the fact that in 1866 it became necessary to do all its own printing. No firm in Pittsburgh, or perhaps in the whole country, was capable of producing, either in kind or quantity, the work requisite in carrying on the trade of the rapidly growing business. In the Printing and Binding departments, alone, there were employed eighty compositors, pressmen and others. 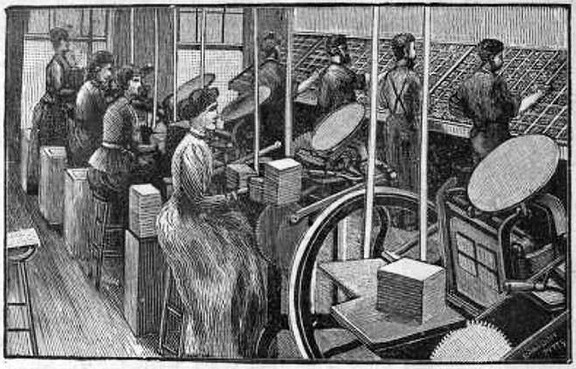 The equipment in machinery consisted in part of ten large cylinder presses, and eight smaller ones, all of which were kept running ten months during the year upon the publication of Hostetter’s Illustrated United States Almanacs, which were printed in the English, German, Dutch, French, Spanish, Welsh, Norwegian, Swedish and Bohemian languages. As noted above, their first Almanac was issued in 1861 and was published only in German and English, increasing its edition each year and reaching, in the year 1867, one million copies, which were disseminated in these two languages. Still increasing its edition each year it reached, in 1876, 9,000,000 copies, which were produced that year in all the various languages above enumerated, the average issue per year eventually leveling out at 10,500,060 copies. This consumed annually, 16,000 reams of white paper, and about 2,000 reams for covers alone. 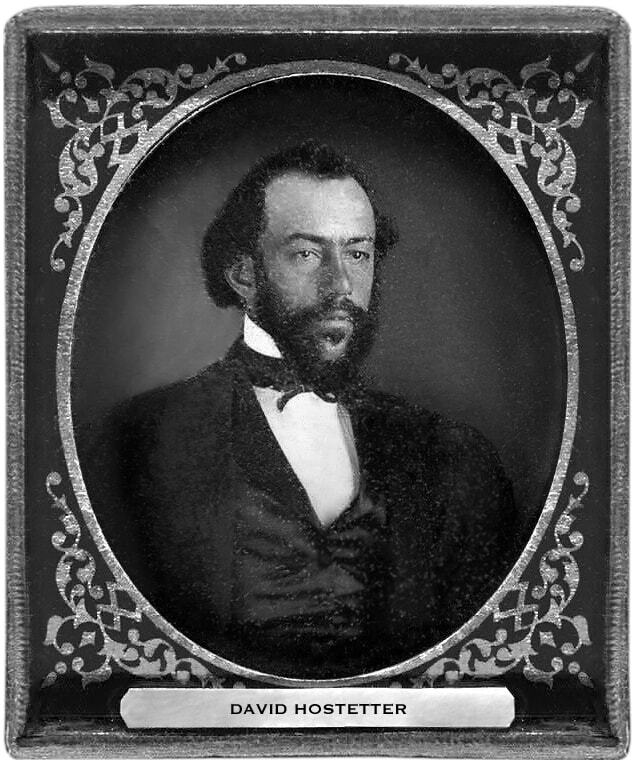 With his business flourishing, and using his capital and experience, David Hostetter, in 1867, became a director in the Pittsburg Gas Company and in 1869, was elected president. He remained in this position and was a very influential person in this institution. He was also the largest stockholder and one of the most energetic movers in the East End and Allegheny Companies. In March 1874, Hostetter purchased the charter of the Columbia Conduit Company and hastened the work forward to completion. Upon this occasion he was elected president but he declined to accept the office. With the Penn Gas Company in Philadelphia, he was a prominent director and also the second largest stockholder. He was also a director in the Farmers’ Deposit National Bank and in the Fort Pitt Bank of Pittsburg. George W. Smith was largely engaged in other enterprises too, and was regarded, in the fullest sense, as a self-made man, liberal, intelligent and sincere. As an aside, the city of Pittsburgh’s name is commonly misspelled as Pittsburg because innumerable cities and towns in America make use of the German -burg suffix, while very few make use of the Scottish -burgh suffix. This problem was compounded by the fact that from 1891 to 1911, the spelling of the city’s name was federally recognized as Pittsburg. Now of course, we spell it Pittsburgh. As noted above, David Hostetter was connected during his life with various public and private enterprises; he was also the organizer of the Pittsburgh & Lake Erie Railroad, known as the “Little Giant” which enabled the city of Pittsburgh to secure a competitive outlet to the North and Northwest; one of the promoters and prime movers, with Franklin B. Bowen, William H. Vanderbilt, and others, in the organization and development of the South Penn Railroad Company, which enterprise was throttled by the Pennsylvania Railroad Company before its completion; one of the pioneers in the production, carriage, and utilization of natural gas, and also of oil and connected with the construction of the Pittsburg Water Works plant. Upon the death of George W. Smith in 1884, his interest was purchased by David Hostetter, and the firm name changed to Hostetter and Company, with Milton L. Myers as a partner. The partnership ceased upon the death of David Hostetter in 1888. Hostetter was said to be worth from $5,000,000 to $15,000,000 upon his death. Quite an amazing accumulation of wealth and an amazing story of success in America. 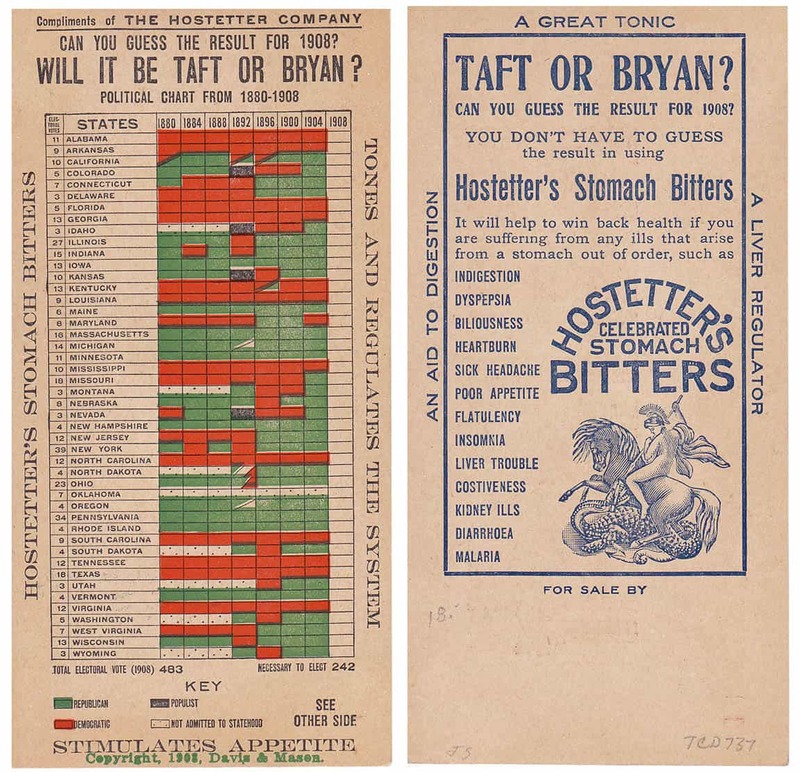 On April 10th, 1889, The Hostetter Company was incorporated by the widow and surviving children of David Hostetter, with D. Herbert Hostetter being president and Theodore R. Hostetter, vice president. 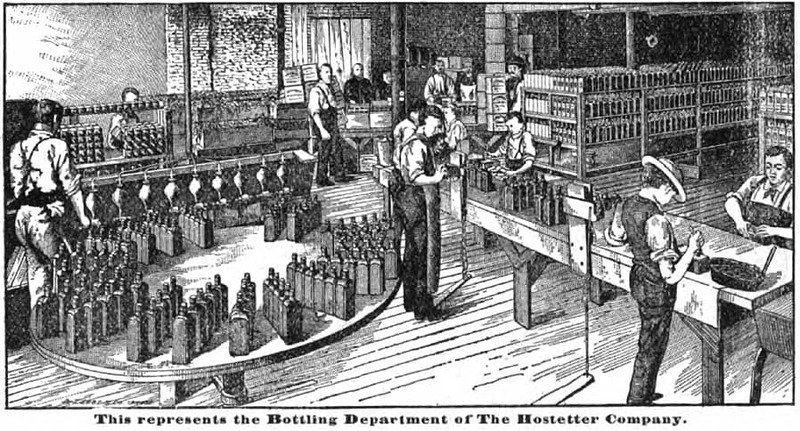 Circa 1890 illustration of the printing and label department of The Hostetter Company. Theodore R. Hostetter died in 1902 and D. Herbert Hodstetter, Sr. died 1924. Upon the death of the latter, Frederick G. Hostetter and D. Herbert Hostetter, Jr. sons of the deceased, were elected president and vice president, respectively. Frederick G. Hostetter died in 1931 and his brother D. Herbert Hostetter, Jr. succeeded him as president of The Hostetter Company. 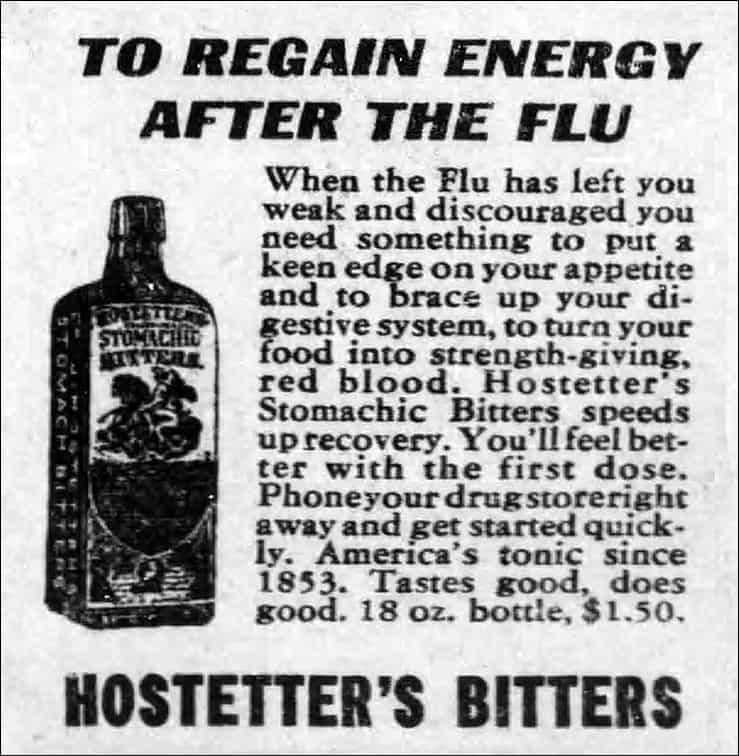 By 1934, the business was in its fourth generation of the Hostetter family and in its 81st year of uninterrupted health-giving to the American people. 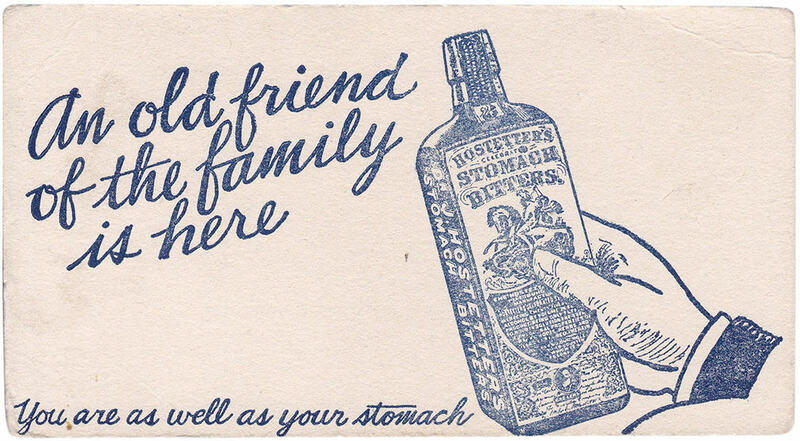 Richard T. Siri, Western collector, and 2018 FOHBC Hall of Fame member, is the absolute authority on Hostetter’s Stomach Bitters. 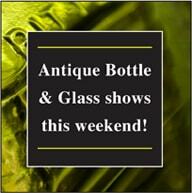 His knowledge is as deep as his collection and he has displayed his Hostetters at many bottle shows and conventions. 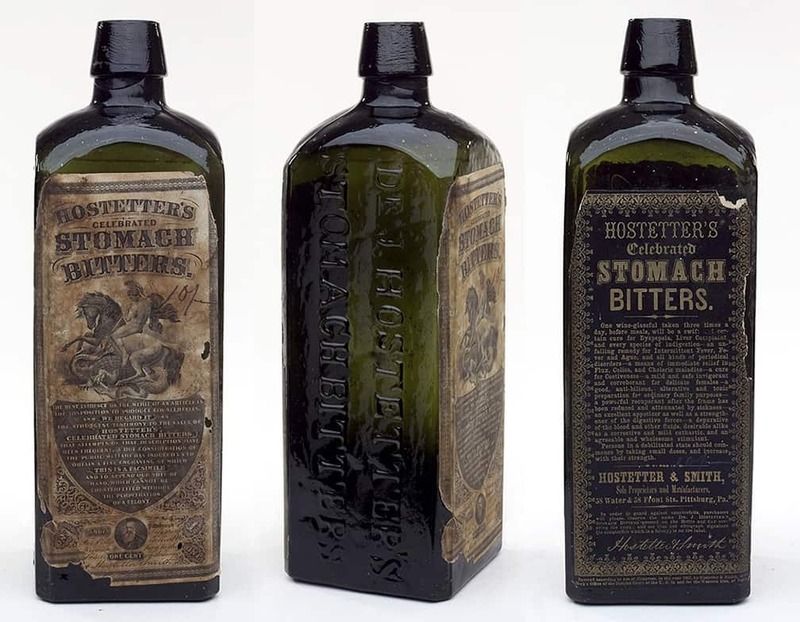 Richard states in Bitters Bottles Supplement that there are many variants of Dr. Hostetter’s Stomach Bitters bottles. Variations in height, and size of embossing as well as variations in the R embossing of DR are often noted. Bill and Betty Wilson in Western Bitters, 1969, was the first work that cataloged more than the generic identification. Their work identified thirty-nine different variants. Later variants were identified by Carlyn Ring in For Bitters Only, 1980. 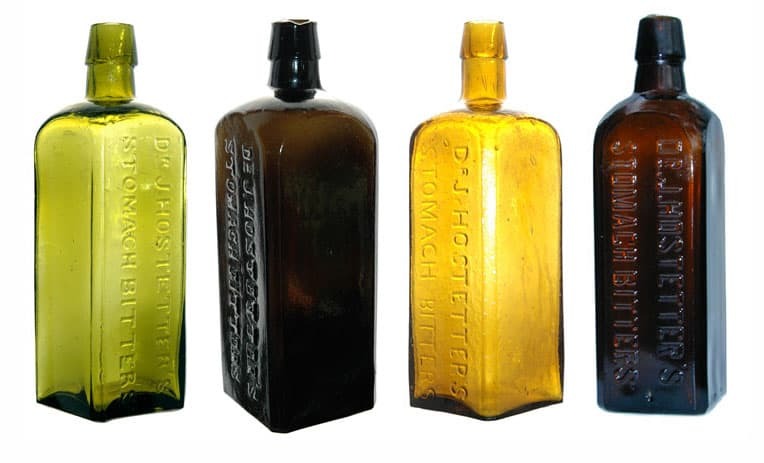 A group of applied mouth Dr. J. Hostetter’s Stomach Bitters bottles with 166 variants was eventually assembled. This group was made up of a large collection assembled in the West Coast combined with a large collection assembled in the Midwest and East. 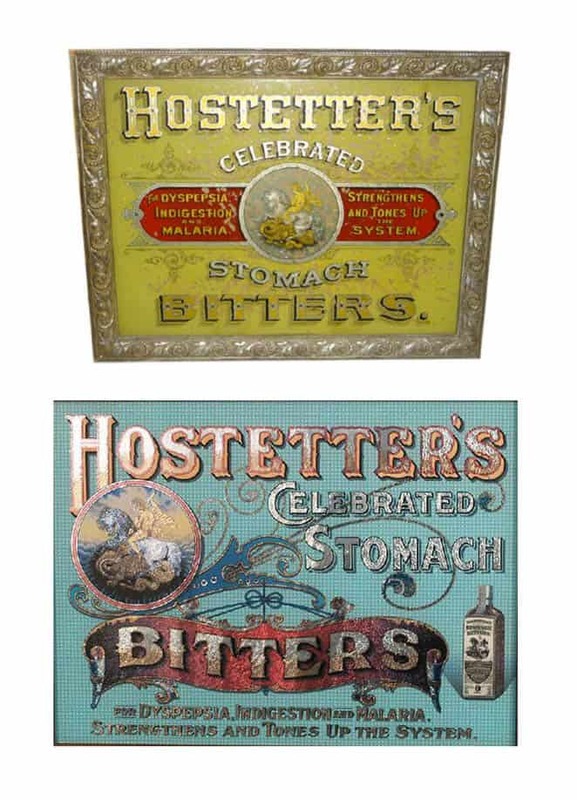 Read More: Look at this Color for this Hostetter’s Bitters! 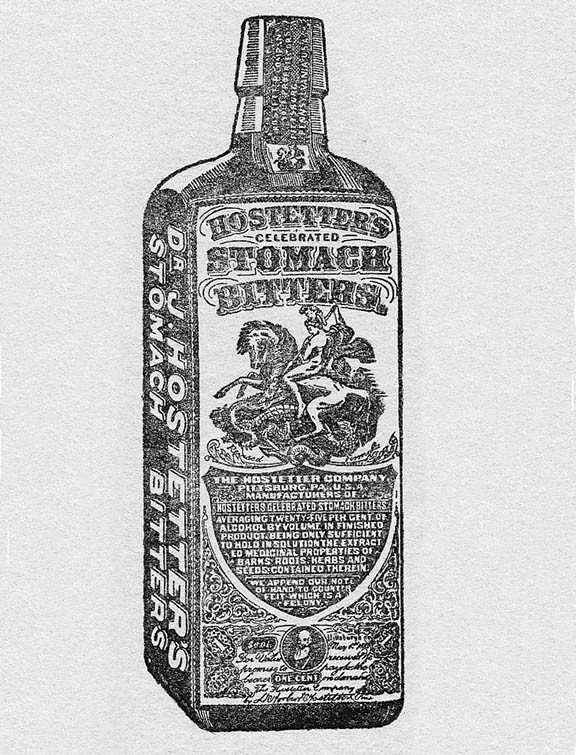 This entry was posted in Advertising, Bitters, Civil War, Collectors & Collections, Ephemera, History, Liquor Merchant, Medicines & Cures, Tonics and tagged almanac, bitters, Celebrated, Civil War, Compound, D. Herbert Hostetter, David Hostetter, Dr. Jacob Hostetter, Dragon, ephemera, famous, Frederick G. Hostetter, George W. Smith, Gold Rush, grocer, Hostetter & Smith, Hostetter and Company, Joe Gourd, Jr., lancaster, manufacture, Mary Landis, Medicine, Pennsylvania, Pittsburg, Pittsburgh, Railroad, Richard T. Siri, Rosetta Cobb Rickey, San Francisco, St. George, Stomach, successful, The Hostetter Company, Theodore R. Hostetter, Tonic, Water Street, york. Bookmark the permalink.